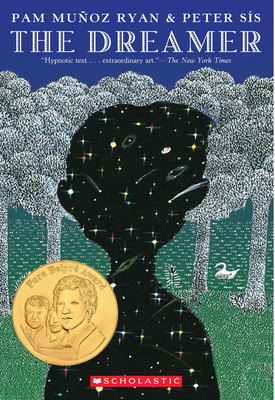 A tender, transcendent, and meticulously crafted novel from Newbery Honoree, Pam Muñoz Ryan, and three-time Caldecott Honoree, Peter Sís! Combining elements of magical realism with biography, poetry, literary fiction, and transporting illustrations, Pam Muñoz Ryan and Peter Sís take readers on a rare journey of the heart and imagination as they explore the inspiring early life of the poet who became Pablo Neruda. Peter Sís is a Hans Christian Anderson Award winner, a three-time Caldecott Honoree, a Sibert Award winner, and a MacArthur Fellow. He is the illustrator of Pam Muñoz Ryan's The Dreamer, a Pura Belpré Award winner, a Boston Globe-Horn Book Honor Book, and an ALA Notable. Sís's many celebrated picture books, including Starry Messenger: Galileo Galilei, Tibet Through the Red Box, and The Wall: Growing Up Behind the Iron Curtain, are treasured by readers all over the world. His most recent picture book, Ice Cream Summer, was hailed by Kirkus Reviews in a starred review as “an encomium to summer, to the power of learning, and to that beloved, creamy-cold treat.” When Peter isn’t traveling the globe eating ice cream, he creates picture books and fine art that can be seen in galleries, museums, and public spaces from New York to Los Angeles, London to Prague, and lots of cities in between. Visit Peter online and learn more about his award-winning books at www.petersis.com.